A King James Christmas: Biblical Selections with Illustrations from around the World is the story of Jesus Christ that is divided into three parts: his birth, his childhood, and his teachings. [button link=”http://www.amazon.com/dp/193778603X/nosim?tag=5thgrade-20″] Buy on Amazon [/button] For Schuon and Fitzgerald this book comes from their own passion and represents many years of dedicated, selfless devotion to creating a work of art that celebrates the true meaning of Christmas that is intended for the whole family from the pre-schooler, to the second grader reader through teens to adults. What makes this book universal for Christian readers all over the world is the selection of art that comes far and wide from Russia, Italy, England, Germany, China, the Netherlands, Macedonia, and even from the hands of Catherine Schuon. A list of the illustrations, the time they were painted and by whom, as well as the location where they hang can be found at the back of the book. 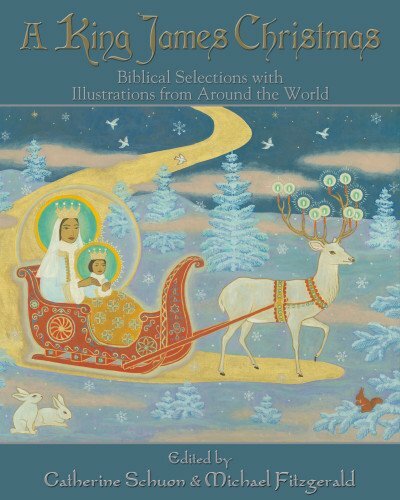 A King James Christmas: Biblical Selections with Illustrations from around the World is an heirloom book you will want to read aloud with your family every Christmas and pass down to future generations. Every detail from the tiniest of considerations is thoughtfully executed from the selection of artwork to the large font and insertion of more common expressions to ensure that readers of all ages will understand some of the archaic text taken directly from the King James bible, written and completed in the year 1611.